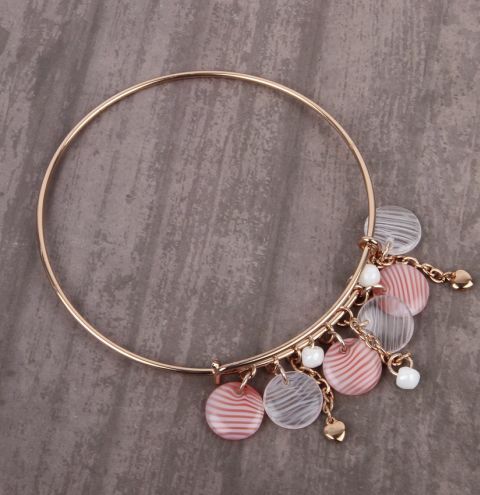 Learn how to make a delicate Rose Petal Bangle using new glass beads from Preciosa! Cut 3 pieces of chain approx. half an inch long. On the end of two of them, open up a link of chain and attach a heart charm to the chain. On the other, use a jumpring to connect a mushroom bead to the end. Take 3 pink beads and 3 clear. Attach a jumpring through each hole, and use another jumpring to attach them to the bottom of the bracelet base. Attach your chains in the same way in between the beads.